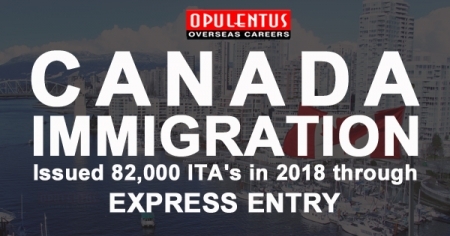 Canada immigration officials crossed 80,000 ITA's for 2018 in the new Express Entry draw, which held on Nov 28. The Express Entry draw observed 3,900 applicants announced ITA's for the fifth following Express Entry draw and the 6th in the year 2018. The latest draw observed the lowest score of the Comprehensive Ranking System drop by 04 points to 445. The current draw brings the entire ITAs announced in the year 2018 to 82,000. IRCC has a highly skilled immigration intake goal of 74,900 for the running year. It was the 25th invitations round below the Express Entry in 2018 and 105th overall. I.R.C.C can now fix a specific invitations number to be announced. Where the candidate's number with the minimum score exceeds the number of invitations permitted, officials give preference to the profiles that have been in the pool of Express Entry for the longest time. Thus, if higher than one applicant has the minimum score, the cut-off solely depends on the time and date they provided their profiles in the Express Entry. The most significant candidates number called in a specific draw since the reform is 3,900. The new setup favors immigration executives higher control to achieve a higher fine-tuned approach for determining a specific candidates number to be announced an ITA. The former system did not permit this. Despite the new change, the current draw maintained the trend under the System of Express Entry where the minimum CRS score was well beneath 500. It was the 34th Express Entry draw since immigration officials substantially changed the Express Entry System of Comprehensive Ranking on Jun 6, 2017.